A Guide to the Business Analysis Body of Knowledge® (BABOK® Guide) is the foundation of the business analysis profession, and the starting point for a business analysis career — but it's not the whole story. In the years since IIBA published version 2, the Business Analysis community has discovered many important implications to the knowledge collected in the book. These discoveries go beyond the text, or interpret the text, in ways that are not always obvious. The Exploring the BABOK® Guide webinar series is our attempt to share these ideas to you, from many points of view. 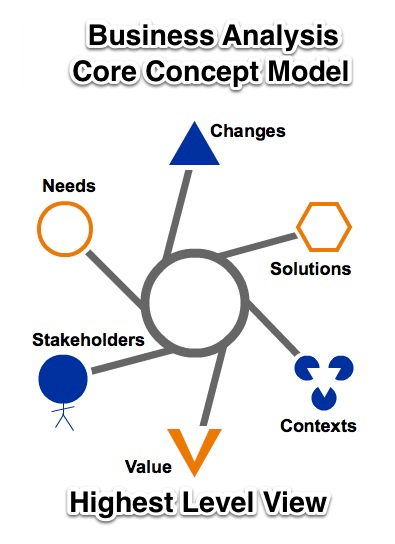 Since many realizations and discoveries are integrated into the Business Analyst Core Concept Model™ (BACCM), it will also be part of the discussion. Each month, the Exploring the BABOK® Guide webinar series brings together panels of business analysis thought leaders to explore some aspect of the BABOK® Guide, and to provide advice to practicing BAs. These hour-long shows will begin with a presentation and discussion among several panellists, followed by 20 to 30 minutes of Q&A from the audience. Q&A: What do you want to know about the series and the BABOK® Guide? Will you join our explorations? How deep is the rabbithole? I'm playing Ingress. Back to work. Welcome to 2013!